As the 2018 hurricane season approaches in the Caribbean, and addressing disasters and crisis in other communities globally. Always consider the organization that you are giving humanitarian financial assistance. Ensure that you've investigated and research the organization and the actual 'ACTIONABLE' work doing in communities. Those organizations that truly need the funding directly are there now in the community working tirelessly, and on limited funds that will still be there when the crisis arises. To our members and friends in the Caribbean I endorse the Caribbean Emergency Management Agency (CDEMA) Emergency Assistance Fund (EAF) as a resource to receive funds for communities in need throughout the Caribbean when the crisis and disaster strikes for both short and long term recovery. I recommend to our Relief & Recovery membership category members to ensure accountability and transparency of funds to communities be provided to the CDEMA EAF. 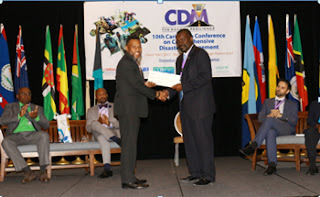 I attended the 2017 CDEMA Conference in Nassau, Bahamas and commended Ron Jackson, Executive Director on ensuring the community in need received the funds at the lowest level. CDEMA has been preparing thru education & training all member nations of the agency for the upcoming hurricane season, and ongoing climate change events in small island nations. Support your local organization, support organizations that are contributing now and in times of need when the disaster strikes. For our members in the Caribbean, support CDEMA and the CDEMA EAF. The presentation was made to the countries during the general plenary session on Advancing School Safety in the Caribbean at the 10th staging of the Caribbean Conference on Comprehensive Disaster Management, which is being held at the Melia Nassau Hotel, The Bahamas on December 4th – 9th, 2017. The cheque donation to both BVI and TCI were made possible by the monetary contributions received through the CDEMA’s Emergency Assistance Fund (EAF), which was launched via an online donation platform as well as direct deposits during the response and relief operation phase for both Irma and Maria. Donations were received from individuals, companies and governments. Representatives from both territories expressed deep appreciation by thanking CDEMA and all donors for the overwhelming support to help recover and rebuild after the widespread destruction caused by the catastrophic hurricanes. 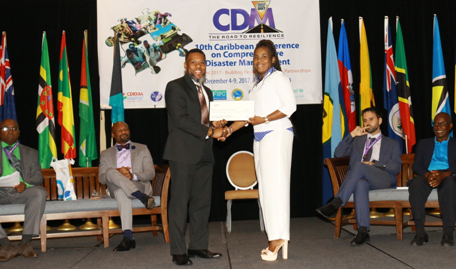 The 10th edition of the Caribbean Conference on Comprehensive Disaster Management (CDM) is being held under the theme “The Road to Resilience – Check Point 2017: Building Resilience through Partnerships”. Over 250 delegates from across the Caribbean and the world gather to participate in discussions on disaster management and climate change issues affecting the region. It is hoped that the conference will contribute to the enhancement of resilient capacities and partnerships to fight climate change and strengthen comprehensive disaster management activities going forward.